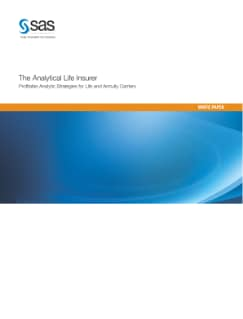 In the insurance industry, the companies that focus on product lines typically under the diversified insurance umbrella (such as group and individual life, annuities, retirement plans, financial services and supplemental health products) have been slow to adopt predictive analytics within their organizations. Other industries, including property and casualty insurers, continually demonstrate success in using analytics to grow their businesses more profitably and increase revenue while managing risk. Life insurance executives are beginning to recognize the need to evaluate analytics as a way to innovate, differentiate and improve their organizations. This paper discusses business strategies enabled by analytics and provides examples of analytic innovation that insurers can introduce into their business processes.